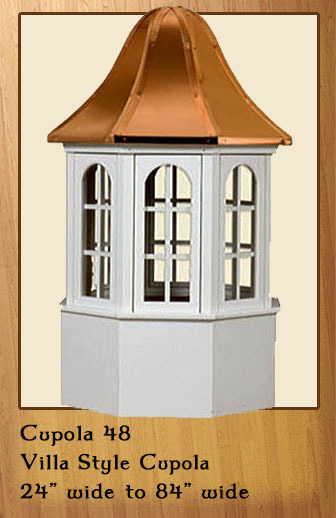 the cupola correctly for you. ​Look below for our Cupola Videos. Arched louvers on all four sides. Arched louvers on all eight sides. 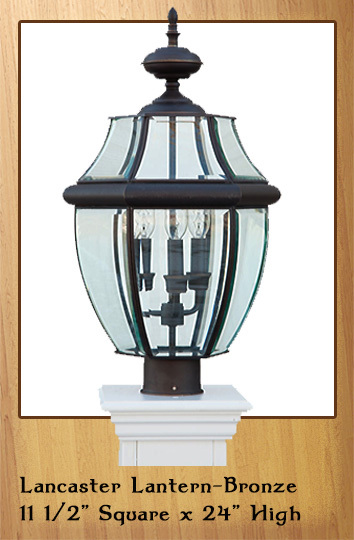 Accent your window cupola with this antique style lantern. Arched windows on all four sides. 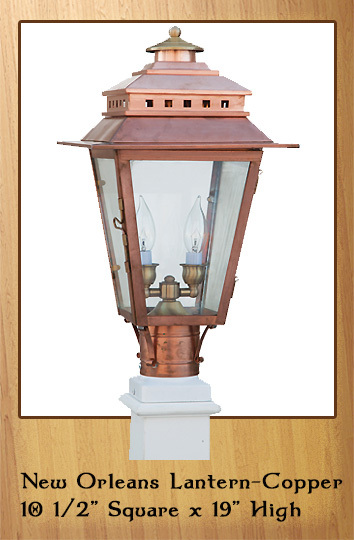 With a Bronze finish for your cupola. Arched windows on all eight sides. Concave roof, windows and louvers. Straight roof, windows and louvers. Here we are right where the cupolas are built. 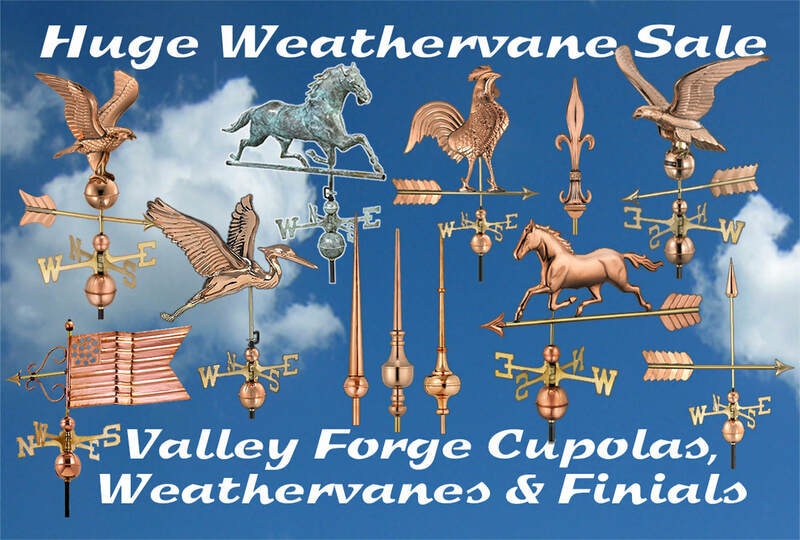 ​We can help you select the perfect size and style cupola and weathervane for your home or building. 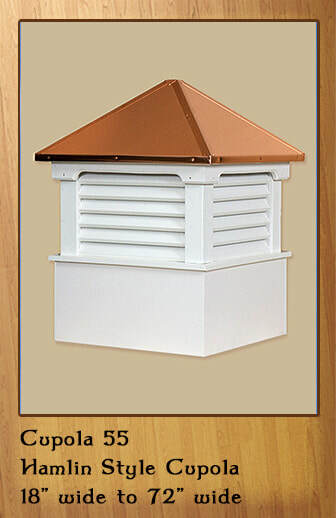 Beverly is shown with the beautiful 30" wide Hamlin style vinyl cupola with a Copper Roof. ​Rick is standing inside of a 60" wide window cupola. cupola would look on their roof. added under the cupola roof. ​ of this lovely home. that was sent in my digital quote. 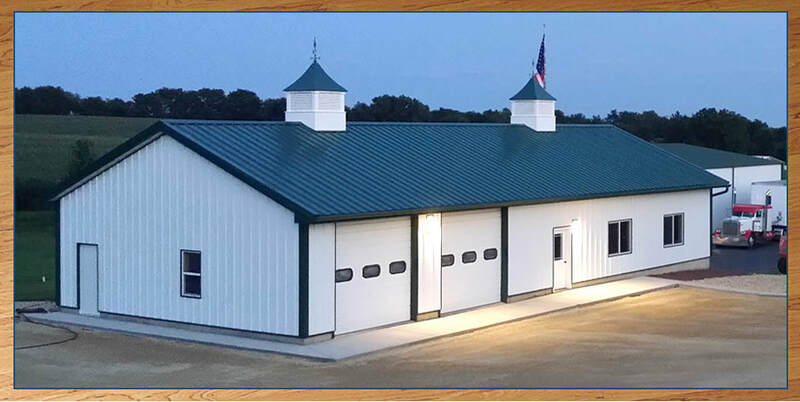 ​Here you can see two 48" vinyl Morton style cupolas on a 65' roof metal . 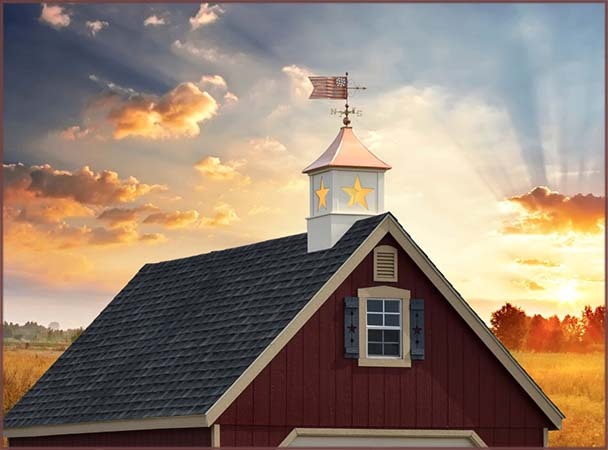 These two cupolas look fantastic on this roof. 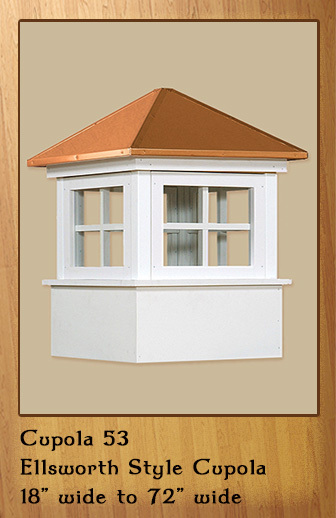 On the left your can see a 30" wide Hamlin with corner trim added to the base own a 25' roof. 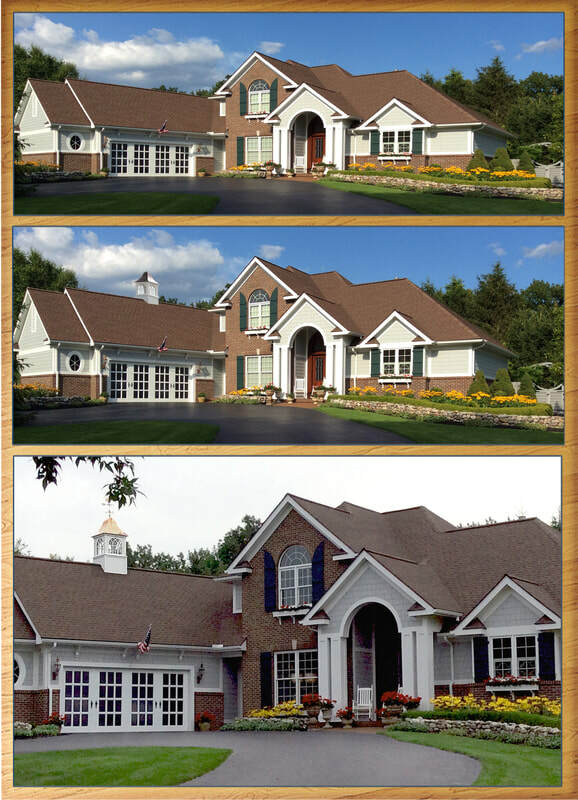 ​On the right you can see a 42" wide Waterford style cupola on a 36' roof. 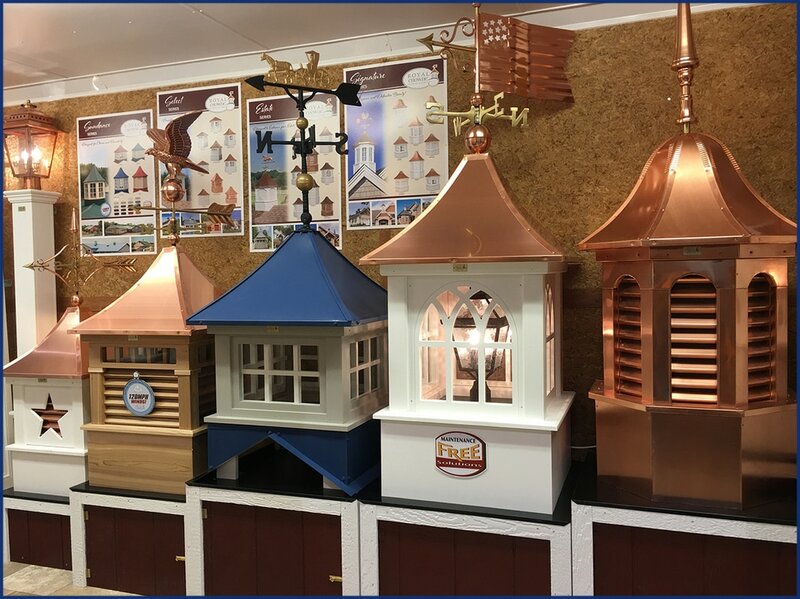 Both cupolas look terrific. ​Here we are at the Lancaster County Showcase with our Amish cupola makers. We visit them frequently. 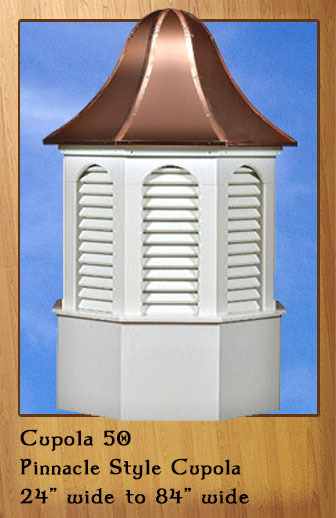 These are beautiful maintenance free Royal Crowne maintenance free vinyl cupolas with beautiful copper roofs. 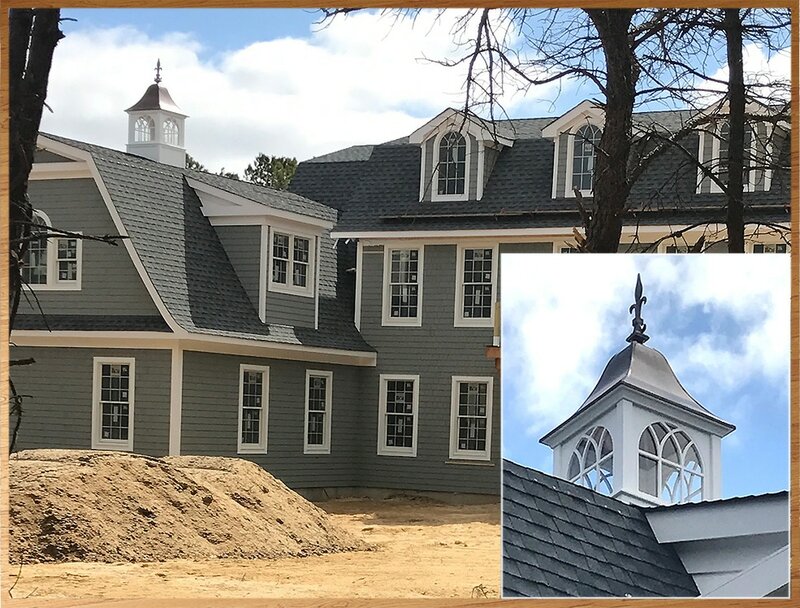 ​Here you can see the fabulous Vinyl Roxbury style cupola on new construction. 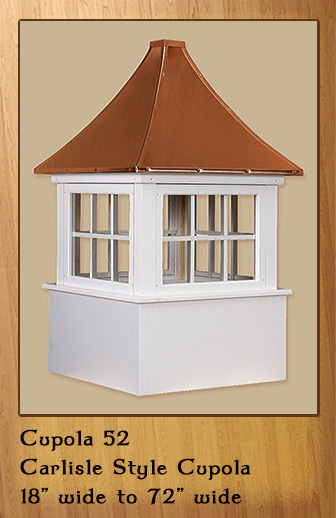 The 36" wide Roxbury cupola is shown here on a 28' roof span. We did a digital quote showing our customer exactly how the cupola would look when installed. 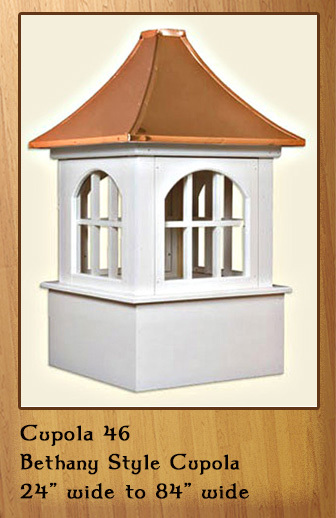 Look at the beautiful Cedar cupolas shown above. 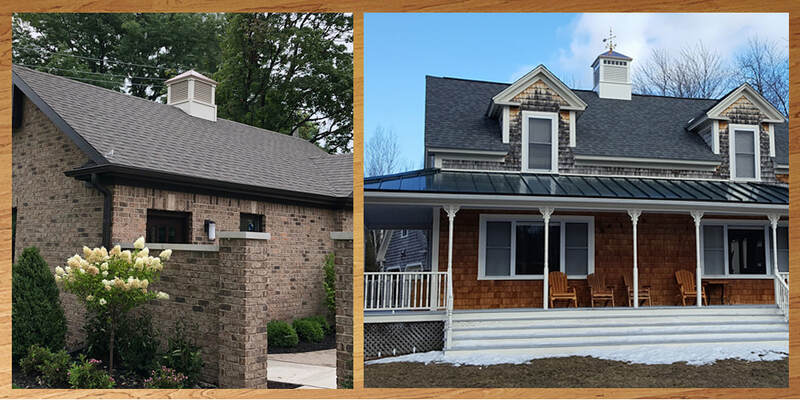 On the left is shown a 60" Cedar Ellsworth style cupola with arched windows. 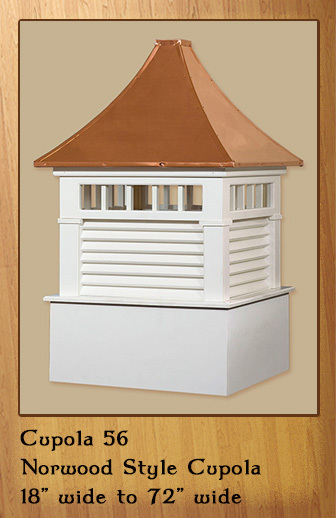 On the right is shown a 42" Cedar Dalton style cupola on a 36' roof. 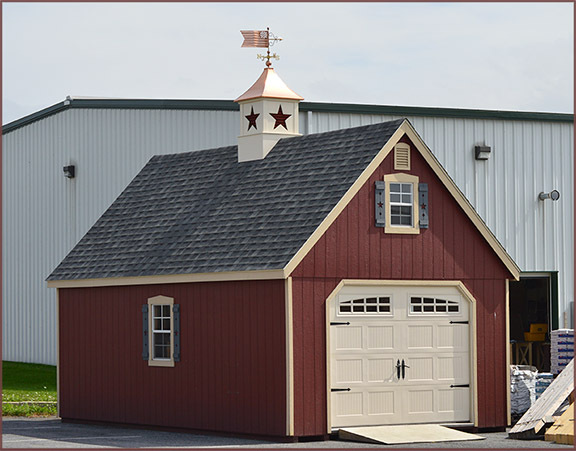 These Cedar cupolas with modern Cedar Barns. 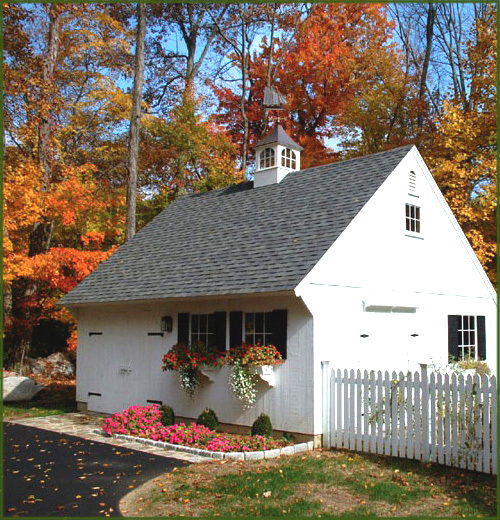 Many of these barns have been converted into homes. 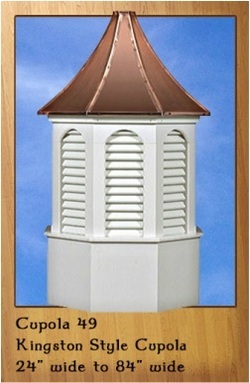 The Designer Series Cupolas are very unique in design and are sure to add class and charm to your roof line. 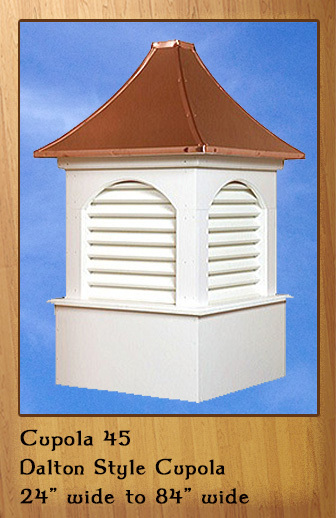 Concave or bell roofs, windows or louvers. 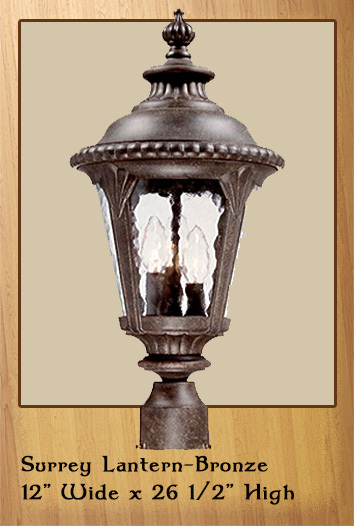 Exquisite styling for that extra stylish touch. ​ the window on the cupola on the left. 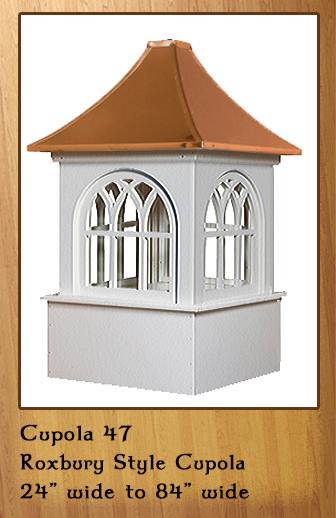 Cupola roofs are also available in many colors. 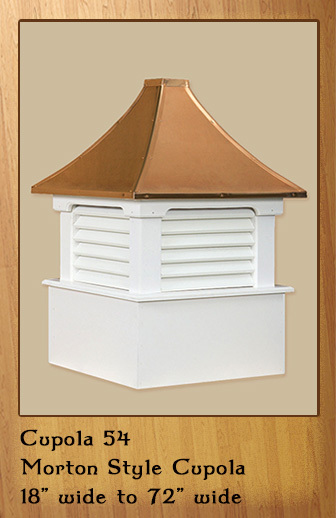 These cupolas are manufactured solely of a vinyl-PVC trimboard and capped with a copper roof. 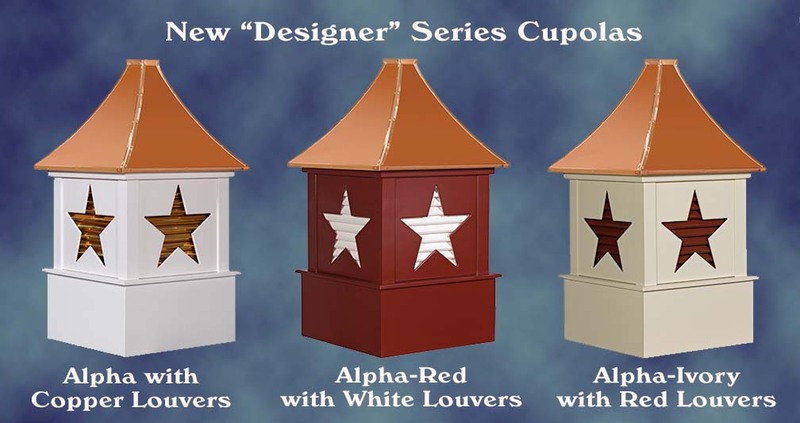 Colorful "Designer" cupolas with a star accent. 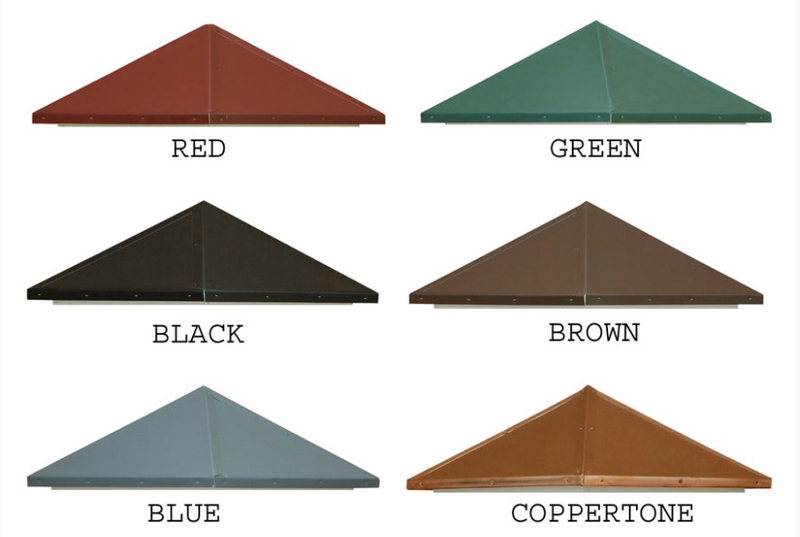 Contrast a copper or colored roof with a colored star. 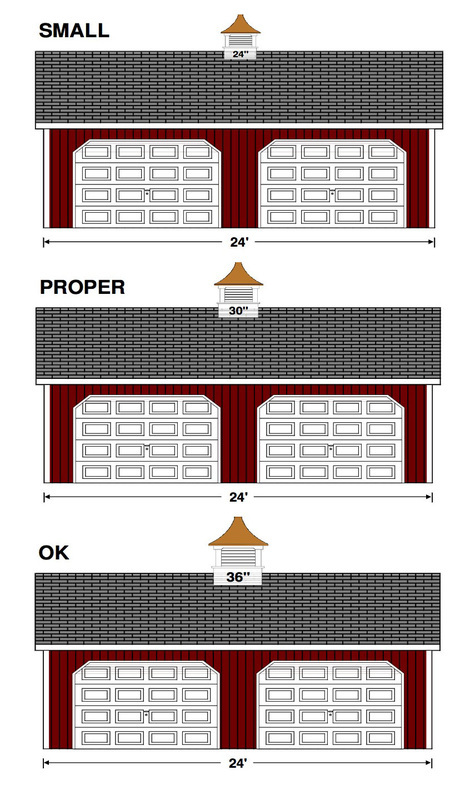 ​The diagram on the right is to help you determine the proper size cupola for your building. 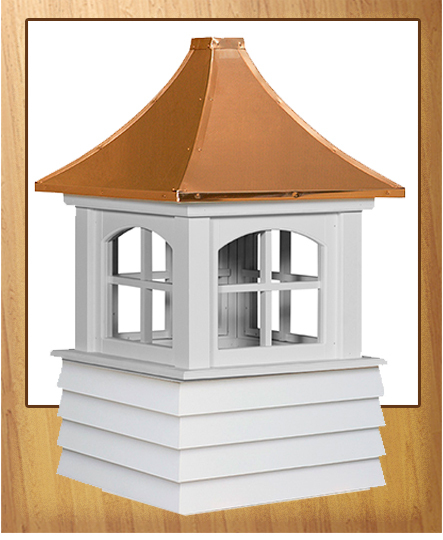 A general rule of thumb is a minimum of 1.25" of cupola for every foot of unbroken roof ridge line. 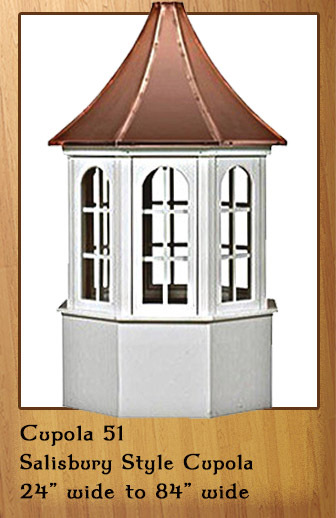 In this case of a 24' long building the recommended size of cupola would be 30" or greater. 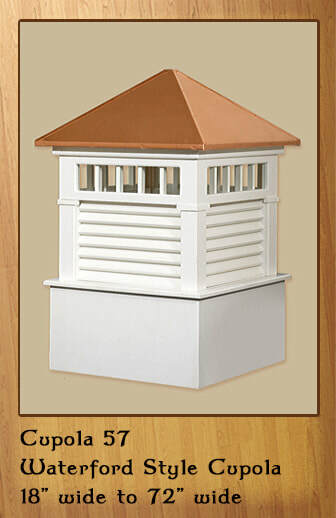 A 30" cupola is properly sized but a 36" model looks very good too.